Last week I finished this piece - Sargent from Kick Back and Stitch. It was my travel project, and only took about six weeks for me to do, solely when I was away from home. I like the colors and the way it turned out, which is a good thing, since there are several more in the series in my stash. My only complaint was that the kit from Fireside Stitchery skimped on a couple of the threads and I had to go out and buy more. The shape looks like Maryland to me this week, with the trailing down area on the right. I'm sure it'll change by next week. There's a lot to go with this, but I'm surprised by how much progress I'm making. I think it's because there are large blocks of the same color. Four buildings complete this week. Yay! I was able to complete the two with the detached tops and the two flanking the center building. Fewer and fewer left to do. 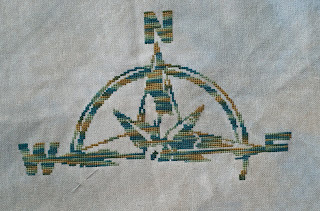 I also got a lot less stitching done this past week than usual. I was in the car driving at least three days and there's a project I've been working on that I'm unable to show you at this time. It's taken a lot of my remaining stitching time. It should be done in a week or so, though. Marquoir has a lot going on these days, and here's a part of it. It's called Herz Rot-Weiss, but as you can see, I changed the colors. This is the first of many sections, and I'm halfway through it. Silkweaver solo fabric and Vikki Clayton's silks. I like the way they look together. Anyway, it's in my rotation now and I'll be keeping up with it as well as I can. I was the last person to work on Cobi W.'s Autumn Round Robin block, and I finished it up this week. I added a leaf on the top left, a buddha charm in the middle, and two seams - both beaded to one extent or another. This top picture is before my work, and the bottom one is after. This week, it was cream and white for the upper window and peaches for the stucco. Got some done, and I'm progressing pretty well, considering. For the past two Saturdays, Pocono Mountain EGA has been having a kumihimo workshop. This is my sampler braid after the first week. I went home and finished it the next day. The technique is pretty easy to get a handle on, but it can get confusing making sure you're doing the right pattern for what you want. I'll be using the technique to make custom trim for ornaments and such, so expect to see some more eventually. This is from Kick Back and Stitch and called Sargent. I've had it as my travel/takealong project since mid-July, when I went to Grandfather Mountain Highland Games. This picture was taken at the beginning of August, but I've just now gotten around to posting it. I'll be doing a series of these - Fireside Stitchery is offering them as a wreath project, but I won't be doing the wreath. Anyway, I really like all the bright colors. 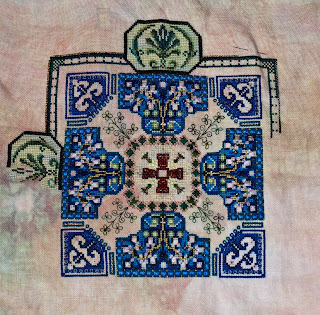 Stitching is easy, and the project's so small I'm not using stretcher bars. I don't know what happened this week, but the color came out near perfect on the picture. It's really this color. I started on another color on the second line and finished the second color on the top line. It's progressing, and I really like the colors. This Tentakulum fiber is really nice to work with, too. I finished Zentangle this week! The colors are all ones I normally wouldn't pick. I got them in grab bags from Hand Dyed Fibers, and decided to use them on this project. I think it worked. I learned how much I rely on overlapping areas on multi-page charts with this project -there were none until the last couple of parts. I know it's to be framed, but I don't know how it's going to be framed yet. I got the second connector between eggs done this week. It means I'll be doing only the second egg until I can start the third connector. Things are definitely progressing. I was gifted several Heaven and Earth Designs charts during their sale a couple of weeks ago. This was one of them - Oriental Courage. It's my second posting on it, but I couldn't resist the title. Anyway, I'm working on it daily and it's making a lot of progress. 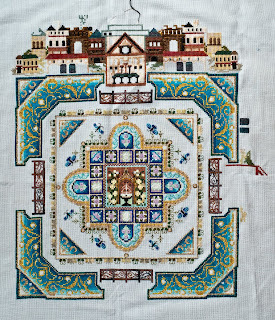 It's one of their bookmarks (storykeeps), and is supposed to be three by twelve inches. So far, I've got almost half an inch complete. I would be parking threads, but since the colors are all reds and so close, I was unable to track which was which. This week's work was mainly dark brown lowlights in various folds of the skirt. It extended the skirt down quite a way more. Parts four and five of the kaleidoscope mandala are done; I finished them before starting the last part of Zentangle. I like the way the colors are looking and it's not a hard stitch. I won't be getting back with part six, though, until I'm done with the next part of See the Star and the first parts of Red and White Heart and Tam's Christmas Mystery. Lots of stitching going on in Marquoir. Yay, I started the last part of Zentangle! 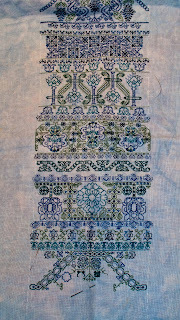 This means I'll have one of my Marquoir stitchalong pieces done. It's a good thing because two more started this month... now on to stitch and finish this. The back wheel is nearly complete. I was debating this last week on whether to just finish, but decided not to. I'm getting close to that point, though. I completed the second part this week and continued on with the third. There's still a lot of work to do, even though I'm on the last part. 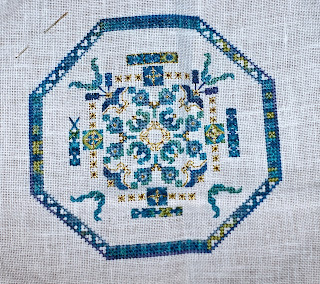 Lots of rice stitches left to do, along with the filigree on the four major sides. I'm still adding flowers to the ladder on this band. Lots more to go, but at least there's some progress. All blacks this week. Some windows and a tower and roof. The middle house looks almost complete now. I participated in the Brooke's Books exchange and here is what I got in return. Myra must have looked at my blog because she sent me these wonderful crazy quilting supplies. Thank you so much, Myra! I've already got ideas running around for them. I also love the focus of the exchange - the ornament. She said it was a design from Faby Reilly, someone I've never heard of. I really like it, though, so I'll have to look at her others. Thanks again! I did more flounce than skirt this week. In fact, I did none of the skirt at all. Instead of skirt, I did the ribbon coming down her side. Although there's still a lot to go, the end is in sight. 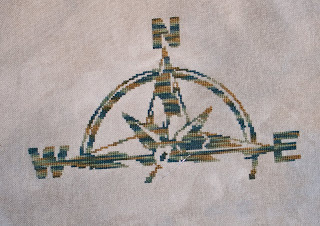 Well, the part I'm working on now looks like an inverted heart, but it also looks like the onion dome of the local Ukranian Orthodox church, just a different color. 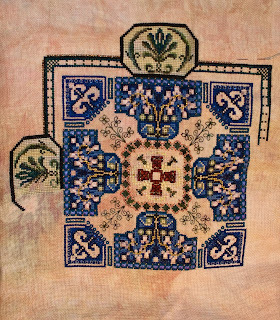 Anyway, I was sent parts four and five together and am working on the second square of part four. Part five is down the side. I like how it's coming together, but I have lots of catching up to do. Well, I made some progress on the big E, but didn't quite finish it. Need one more row and a half. I did, however, start the southwest point, so it's not all bad. At least it is beginning to look like progress again. This week, it was still the door, but it's -really- almost done this time. 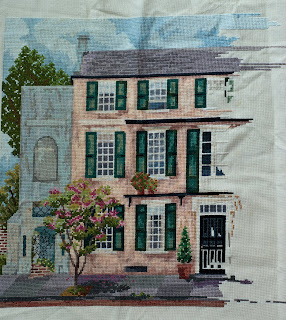 My stitching on this in the coming week won't include the door. Besides the dark gray, I did some of the brick color at the very bottom of the piece. This means I've completed another column on the chart and go back to the top and see what's next. Yup, Bibe's got a foot now. It's to the point where all I have left is very little. Maybe this week I'll just finish him when he comes up in the rotation. I completed the next to last part of Zentangle. One more section and it'll be done. The Marquoir group will be starting another Zentangle some time in the autumn. 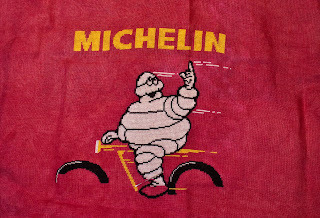 We haven't seen the design yet. I should be able to get this done once I finish up the part of the Kaleidoscope mandala I'm working on. I'm finishing only about a month and a half behind the people who completed it on time. Not bad for me. 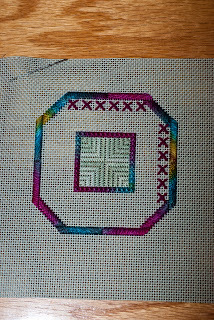 While I haven't quite finished part two yet, I did have floss still in my needle of the right colors to start part three. 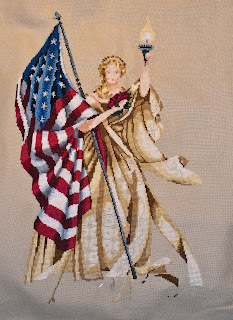 For part two, gold metallic needs to outline the rice stitch bars. Three is the last part, and, unlike the previouos workshop, it has a lot more work. 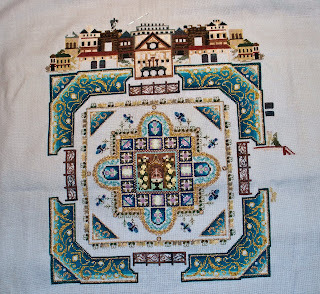 There are cross stitches on the edges and even more rice stitches. On the other hand, it -is- getting done. This week's colors are black and blue. Both are roofs, too. It feels good to get working on the rooftops. Means I'm getting closer to having this part done. 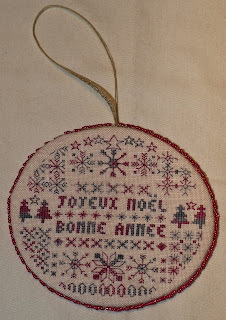 I participated in an exchange on the Brooke's Books yahoo group and decided to just finish an ornament I had already stitched instead of stitching a new one. This piece I completed back in December, but I finished it last week and mailed it to the Netherlands last Friday. I hope the recipient likes it. I think I'll make another one for myself. I thought I might get East done too, but only West is complete this week. I got some of the area around the W done too, at least. This week, I'll have a journey to the East. 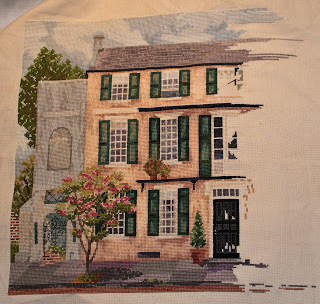 Still working on the door this week; I've almost got all the top done, and the middle squares are almost done too. I'll be working on finishing them and getting the bottom progressed this week. The color on this is too light this time, but you can see I started a new color this week. There's a row of Algerian eyes between the two lines, but I'm going to be doing that last. 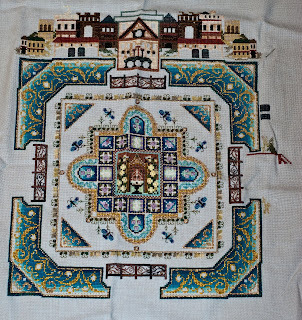 I'll be finishing up the top row and working on the second area at the same time next week. I really do love the colors on this project; I wish they showed up better so you can see what I mean. Still working on part two here. I've almost got it done, though. 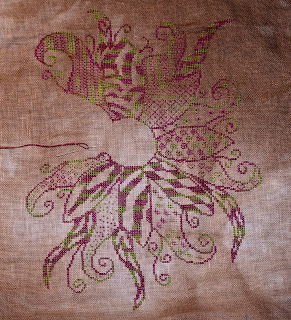 There are some leaves done on the big flowers and the large rice stitch blocks are coming together. I think I'll have this complete before the end of August. I really like this piece. There is more progress on this mandala- the line across is almost done. I only need to finish the black line and sew in the golden line on top. On the second egg, it looks like I will have to stitch with black next too. 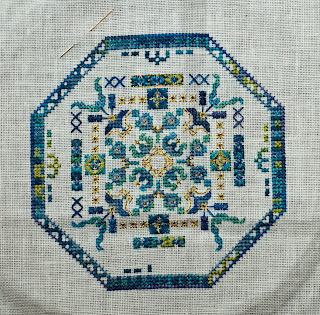 This week, it was the background light green half stitches. The inside of the ladder part is done, and I added in some of the buds and tendrils. It's coming along a little bit faster than I thought it would. Not quite another building done, but some progress. Lots of roofs to add, so I have the feeling I'll finish several buildings on the same day. On another note, I managed to get part of part seven done this week, too.